The new book by Centre Fellow Professor Kurt Remele is an introduction to philosophical and theological animal ethics. It starts with the extinction of the dodo and finishes with a quote by Tom Reagan: “The fate of animals is in our hands. God grant we are equal to the task.” Topics addressed include: philosophical theories on animal protection; how the Catechism of the Catholic Church ought to be revised; saints’ feast days on which animals are tortured; St. Augustine and other church fathers; Pope Francis and the place of animals in his encyclical Laudato si; the concept of the common good that includes the flourishing of non-human animals and a consistent ethic of life which does the same. Professor Remele teaches ethics and at the Department of Catholic Theology at Graz University in Austria. Further information about the book can be found here. 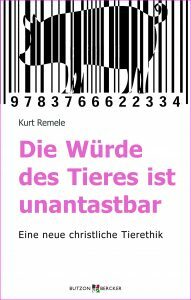 Kurt Remele, Die Wuerde des Tieres ist unantastbar. Eine neue christliche Tierethik. (Animal Dignity. A New Christian Animal Ethics) Kevelaer: Butzon and Bercker, 2016.